In this episode you'll hear what you've been missing and how to get it from the Ancestry Wiki. Also how to do a very specialized type of Google search you may have never tried, a French-Canadian genealogy resource, and more. 5. It’s been almost 10 years since I filmed a reality TV show out here, so I figure they’ve moved on. 1. My Grandsons - Davy and Joey! A few years ago while attending a genealogy conference, I decided to conduct some on-the-fly interviews for The Genealogy Gems Podcast. I asked folks to tell me about the most prized family heirloom that they possessed. I heard about everything from the door knob of a woman’s parent’s bridal suite, to the bedazzling flapper dress worn by a great grandmother. It was a difficult concept to digest. As the acknowledged “keeper of the family history flame” in my family, I’ve been fortunate enough to have inherited an abundance of family heirlooms from both sides of my parent’s families. How sad it would be to have nothing concrete to hold in your hand; nothing to help you feel the generations that held the item before. This motto has never been so gloriously justified as it was recently when a woman from Indianapolis, Indiana received the surprise of a lifetime this Christmas. The Purple Heart awarded to Pat Davis’ father, (a father she never met) was found recently and returned to her. Watch the compelling video below where the daughter holds the unearthed piece of family history in the palm of her hand. Kyla wrote: "I had old photos and letters returned to me by a woman who found me on a genealogy message board. Her father had obtained them from my brothers who were throwing them away. It was like a miracle." I’m pleased to return this year to speak at the 45th Annual Southern California Genealogy Jamboree. This popular conference, hosted by The Southern California Genealogical Society, runs June 6 to 8, 2014 in Burbank, California, USA. The theme of the 2014 Jamboree is Golden Memories: Discovering Your Family History. It promises to pack tons of fun into a long weekend, as it always does. Who Needs Google Reader? Flip Out Over Genealogy Content with Flipboard! Learn how to use the free Flipboard app to turn your favorite genealogy web content into your own free customized digital magazine. You will flip over how fun and easy they are to create and share. 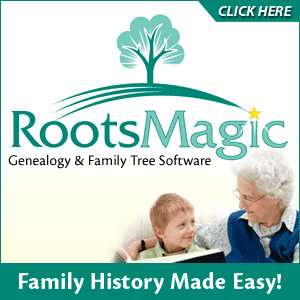 Perfect for genealogists and societies! Learn Google search techniques, tricks and tips to achieve better genealogical search results, and then elevate your search to a strategic level. Finally, see how all of this applies across the spectrum of free Google Tools. How to Create an Exciting Interactive Family History Tour with Google Earth. Learn to tell your ancestor’s story in a captivating multi-media way in Google Earth. Incorporate images, videos, genealogical documents, and historic maps and bring it all together in a virtual family history tour for sharing and research analysis. SCGS Jamboree 2014 welcomes 55 speakers, over 60 exhibitors, 134 class sessions for a variety of experience levels, and special events. Online registration is open on the Jamboree website, and the Marriott’s website is ready to take your reservation. Hope to see you there! Read more about it here. It’s not uncommon for genetic DNA tests to reveal that you’re not related to people you thought you were. But here’s a twist I’ve never heard before. A family who had a daughter by artificial insemination of the husband’s sperm eventually decided to do some DNA testing for family history. Imagine the wife’s shock when she discovered that her husband and daughter shared no DNA! They got a bigger shock when they did a little research. Apparently the biological father worked at the lab that handled the family’s insemination process. The man is dead now, but it appears he may have deliberately swapped in his own sample for the father’s. Of course lots of questions have come up–including how many other children may have received the DNA of a man who was a convicted kidnapper. A detailed overview of what Evernote did is now on their Tech Blog. “After months of work in response to hundreds of user requests, BillionGraves has added several new features designed to validate and enhance the headstone records found on BillionGraves. The Supporting Record feature now allows users to upload evidence-based documents that support the BillionGraves records that have been collected through our mobile Apps. This means that users are now able to upload headstones, birth/death, burial, marriage, cremation, and many other types of records without needing a smart phone. Quotation Marks around a word or phrase mean that the word or phrase must appear in all results. Adding .KMZ or .KML tells Google that you want Google Earth files as the highest priority. Put quotation marks around the file designation and you’ve just told Google to ONLY return Google Earth files. From a concerned listener: "I have a dilemma I'm not sure how to handle. I have a recent ancestor that I never met, but my parents knew. This ancestor did some remarkable things in his lifetime, but also some terrible things to members of his family, some of whom are still living. I want to write about the good things he did, but I don't want to upset the relatives he hurt. Do you have any suggestions on how to handle recent ancestors with difficult pasts?" Lisa’s Answer: I'm sure different folks have different ideas on this. But for me, living relatives come first. If it causes pain to someone living their life today, then I would hold off. I would also feel I was being somewhat deceptive to write up only the positive elements of their life. Deception can be created by omission. And our life activities are interconnected. For example, if a man built and incredible company, it might have been at the expense of his children if they never received his love or time. That is part of the story. To tell the true and complete story, I don't believe the genealogist can cherry pick. And therefore there are times when we must leave stories and lives alone until telling their stories would no longer cause harm to living people. I certainly would not want to allow "terrible things" to continue by bringing it back up in public. That's just my personal opinion on the situation. I hope all goes well in whatever you decide. Lisa wants to know: What do you think? Have you faced this situation, on either end? In this gem, Crista Cowan explains how to find the wiki, how to search it, and how to explore it because "we don't know what we don't know."